Oberheim Four-Voice Synthesizer/Polyphonic Synthesizer advertisement from page 4 of Contemporary Keyboard Magazine May 1977. 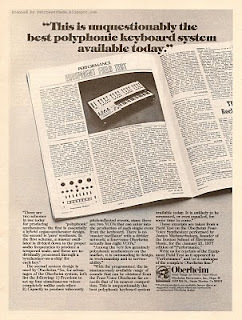 In my last blog post I featured an Oberheim SEM 'Evolutionary' advertisement from July 1977 where I threw out the theory that that ad was in response to a Moog chest-pounding advertisement that ran two months earlier (May 1977). BUT. It wasn't like Oberheim was always on the defense. They had their own hard-hitting advertisements as well, and this one, located opposite the Letters section of CK (awesome real estate!) is one of those ads. Although the ad-copy doesn't mention Moog and the Polymoog specifically, it is definitely implied as using the lesser method of producing polyphony in a synthesizer (mentioning 'synthesizer on a chip' - a direct connection to Moog's description of the Polymoog). Plus, the journal article text mentions the Polymoog in particular. I find this ad particularly interesting for a few reasons. 1. Where Moog often pushed in-house resident expert Bob Moog out front to promote their brand, Oberheim, in this case, used external expert James Michmerhuizen, founder of the Boston School of Electronic Music, to promote the advantages of the Oberheim polyphonic system. James Micherhuizen.... now where have I heard that name? To be honest, I couldn't recall right away, but a quick Google search jogged my memory rather quickly. Among other things, he wrote the ARP 2600 Owner's Manual that is still well-read today! 2. Basically, while Moog and ARP were name-dropping famous rock and jazz greats like Chick Corea, Kansas and Genesis in this issue of CK, Oberheim decided to name-drop the author of an equipment field test article to help promote the more scientific aspects of their Oberheim polyphonic system. An interesting marketing approach. Even more interesting than this advertisement though, is the article on Tom Oberheim that appears in this issue of CK! The article, written by Dominic Milano and simply titled "Tom Oberheim, Designer of Synthesizers) is about three pages long and really shows Tom's unique (and in my opinion humble) view of the synthesizer manufacturing world of 1977. Like any good article from the 1970s dealing with one of the major players in the synth-building game, it starts out with a bit of history, most interesting of which I found was that Tom wasn't into rock music much until he heard the Beatles' 'We Can Work It Out' - he 'was hooked after that'. The article then covers Tom's voyage from building amps for bands like The United States of America (USA), to discovering ring modulators and building one for Leonard Roseman, a composer working on the score for 'Beneath The Planet Of The Apes'. Soon enough, Chicago Musical Instrument Company (CMI), later Norlin Music and then later Gibson) was distributing Tom's ring modulator, and then his Phase Shifter and Universal Synthesizer for guitars ("...really sort of a turkey"), under the Maestro name. "Maestro' was not an actual entity, just a trade name applied by Chicago Musical Instrument Company, later Norlin, later Gibson, to various products made by a number of different companies. When Oberheim Electronics was still my company (1970 thru 1975) I designed and manufactured several products for CMI/Norlin under the Maestro trade name, including the Maestro Phase Shifter (the first phase shifter available for the performing musician), as well as several other effects pedals"
The article then goes through the history of Oberheim Electronics products that I know and love. First the digital sequencer, then the SEM, and finally, the addition of Emu's keyboard to create the 2 and 4-Voice synthesizers. "I took it home one night, put it in my bedroom, and let it run on sample and hold all night". Tom's humbleness comes through when talk of the 'big three' comes up. "... the guy who makes his living playing, is taking more of his earnings and putting them into equipment. Let's face it, ten years ago a guy could buy a Twin Reverb and think that's all he needed for the rest of his life. Now, how many people you know with just one keyboard instrument?" "I get people asking me if they buy a 4-Voice, can they get rid of their ARP 2600 or Minimoog? I have to say 'God no. You need that, too!" Still with me? Great stuff. Thanks for reading!